Fun graphics and colors say, "Whee!," but sturdy construction says, "I'm here to work." 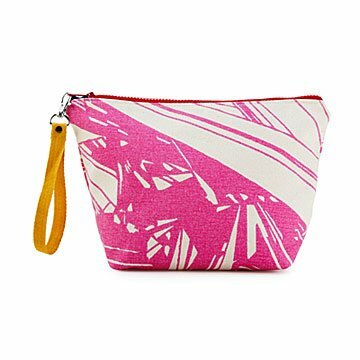 This clutch's vivid colors and energetic graphics, hand-printed with water-based inks, make a direct hit to the brain's fun sector. But it’s also a sturdy, heavyweight cotton canvas workhorse for your miscellaneous item-schlepping and travel needs. The bright-colored, waterproof, and stain-resistant lining helps prevent leaks, and makes it easy to clean. Details like the thick, colorful zipper with colorful corner reinforcements and the short cotton strap with a lobster clasp (for easy carrying) show the meticulous care taken with its construction. The artists and craftspeople who make these are paid fairly and given opportunities to further their own artistic and career aspirations. (The boss is an artist, too, so he understands.) This bag is in it for the long haul—and the fun. Handmade in Philadelphia.